This year's biggest blockbuster till date, Velai Illa Pattadhaari, enters the 25th day of its run today, after releasing on July 18th. The film has surpassed all expectations and has sustained very well, even after the much-loved Jigarthanda which released last week. From multiplexes to single screens, VIP is still holding court and this speaks a lot about the movie's merit, at a time when films struggle to sustain beyond the first week. Anirudh's superhit music, the racy dialogues peppered with heroism, the natural way in which relationships were portrayed and Dhanush's 'mass hero' turn in the 2nd half are some of the factors behind VIP's stunning success. Of course, the dedication to engineers in the end seems to have done the trick big time with the student community across the state. 'Thala 55' gets a wildly popular new figure ? Anjaan gets bigger and bigger with every passing day ! Done with Ajith and Vijay. Next is Suriya ! A.R.Rahman's musical is finally up for release! 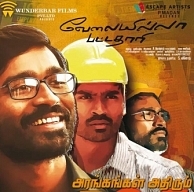 Dhanush with Cuckoo Raju Murugan? Superstar Rajinikanth Appreciates Dhanush ! Shruti Haasan Leads Dhanush And Superstar Rajinikanth ! ''Baasha Was My First Rajini FDFS'' - A New Superstar Rajini Fanatic From VIP..
Dhanush Reminisces Raghuvaran And His Dialogue In VIP Aka Velai Illa Pattathari..
Dhanush Celebrates VIP Success With Team Shamitabh! People looking for online information on Dhanush, Velai Illa Pattadhaari, Velai Illa Pattadhaari 25th day, Velai Illa Pattadhaari box office collections, VIP, VIP 25th day will find this news story useful.